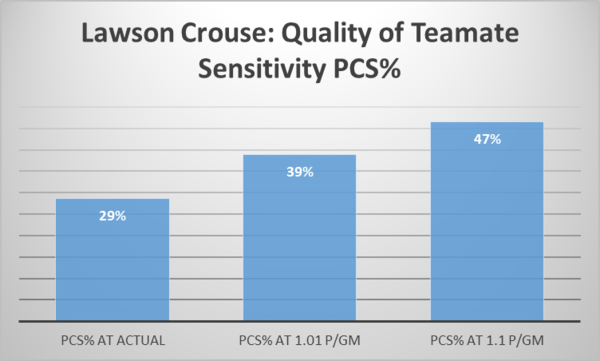 Lawson Crouse has been one of the more interesting draft eligible forward to track this season. Its been well covered by this blog and others that there is a strong correlation between a prospect’s point-per-game and NHL games played, which is why many of us has struggled with getting behind the idea of Lawson Crouse as a top 10 pick after his 51 point, in 56 game season with the Kingston Frontenacs. .. But when you watch him play, it looks like there’s so much more to him than what his boxcars suggest. I’ll try to get to the bottom of the curious case of Lawson Crouse after the jump. A big-bodied power winger with the ability to physically dominate, making him a prominent forechecking presence every night. Possesses good hands that can be used to make crisp passes or to let loose accurate, NHL-level shots; paired with his strength and skating ability, his skill set allows him to contribute offensively, as well as create space for teammates. A big-bodied forward who gives opposing defenses headaches with his effort on the forecheck…tough to contain with his huge frame and strength…impossible to separate from the puck and consistently is successful winning pucks and generating scoring chances through his hard work…moves the puck well with good vision and passing skill…a strong net-front presence… has decent speed for his size, though he could improve his quickness…plays hard on defense; forces plays and takes away angles…uses his size to play physical, including laying some devastating hits…is a moose along the wall down low…tremendous potential going forward. I think you’d have to be nuts not to take Crouse [near the top of the first round]. To get a guy this size … I haven’t seen a guy who physically dominates opponents like this since Eric Lindros. He can drop the shoulder and take the puck to the net. I realize there are other skilled guys in this draft class and guys who have over 100 points, but Crouse was close to being a point-a-game guy. Lawson Crouse has been an extremely divisive player this season, causing some conflict between the stats-centric crowd and the more traditional scouts who rave about his size, intelligence, physical game, and his relatively well developed skating and stick handling. Much of the work Josh Weissbock and myself have done this year on prospect evaluation was to take size into account, in order to appropriate assign value to a player like Crouse who at 6’4 often has the “Power Forward” label attached to his name. The PCS% of 29% indicates that 29% of Crouse’s closest comparables in terms of age, height, scoring, and league, went on to play 200 NHL games. His 0.45 PCS p/GM indicates that of Crouse’s closest peers that played in the NHL, they produced, on average at a 0.45 point-per-game pace in the NHL. By both metrics, Crouse places around 30th amongst this year’s draft eligible prospects, so we’re starting to see value that we missed before, but there’s still a disconnect between PCS and those who list Crouse as a top 10 pick. How can a player that looks this good when you watch him, a player that scouts rave about, and was good enough to earn an invite to Team Canada’s World Junior Team at 17 not manage to fill the net at a more frequent pace in the OHL? As usual, the answer can be found at CHLstats.com. We can see that the Kingston Frontenacs had the second lowest shooting percentage in the OHL (8.2% vs league average of 10.5%) and fourth lowest goals per game in the OHL (2.9 goals/game vs league average 3.5 goals/game). Without their top player, Sam Bennett, for much of the season, the Frontenac’s offense was completely anemic, although Crouse produced a very high percentage of his teams total point, 29.8%, which is 6th highest among 17 year-old OHLers. Clearly, Crouse’s offensive totals were impacted by being on a team that only managed 2.9 goals/game, and this should be considered when comparing him to players like Dylan Strome and Mitchell Marner whose team’s averaged 4.9 and 4.25 goals/game respectively. It should also be noted that Crouse’s scoring improved significantly throughout the season. According to Todd Cordell, Crouse improved from 0.7 points/game in the first half to 1.1 points/game in the second half of the season. Many people have suggested that Crouse may be riding low percentages early in the season, which this seems to support, though this also coincides with the returns of Spencer Watson and Sam Bennett to Kingston’s lineup. So how can we estimate the impact of team effects on Crouse’s scoring, and by extension his likelihood of becoming a successful NHLer? Another method would be to estimate total team goals at a league average shooting percentage and apply incremental additional points to Crouse based on his point share. The Frontenacs had 2,321 shots last year. At the 10.5% league average versus the 8.2% they actually shot, the team would have had an extra 48 goals on the season, or 40 goals in the 56 games Crouse played. Assuming his 29.8% point share remains intact, Crouse’s point total would increase to 63 points (1.1 p/gm), which is consistent with the rate Crouse scored at in the second half. 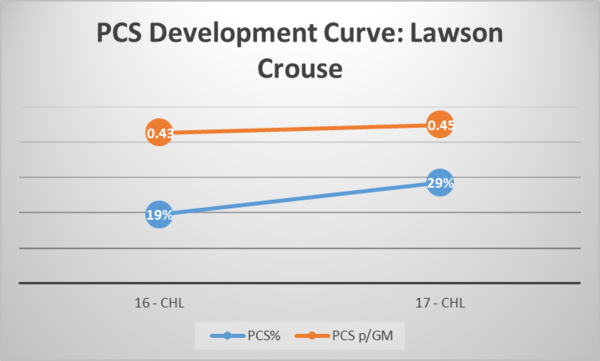 To give context to the numbers above, a PCS% of 39-47% would rank Crouse in roughly the 6-10 range in this year’s draft, which is consistent with the rankings from Corey Pronman (10), Craig Button (10), and McKeens (10), and Future Considerations (6). Looking at the close comparables to Crouse, both at his actual scoring rate as well as his adjusted rates, is also pretty interesting. Names like Corey Perry, Ryan Getzlaf, Rick Nash, Gary Roberts, Ryan Johanson, Patrice Bergeron, and Nathan Horton were all reasonably close comparables to Crouse at one point or another in their junior careers. While there are a number of really good players to choose in the first round of this draft, in my view Crouse should be mentioned among the top options available in the middle of the first round. To paraphrase Chris Edwards, I’d think you’d have to be nuts to discount Crouse’s potential without fully considering the factors that drove his less than inspiring point totals this season. Not to say that what you wrote isn’t interesting or within the realm of possibility … but, to skew statistics to promote a viewpoint is a bit of sophistry. As someone above mentioned, you’d have to apply the same factor to other prospects. Perhaps a better approach would have been to present some historical cases similar to Crouse, that have become impact players. The case that you put forward is similar to why the Canucks picked Jake last year. The size and skills are to much to overlook. Interesting take. I would like to see the same statistical “tweak” applied to a player like Jansen Harkins. I think the result might put him closer to the top ten rankings. Certainly a very similar situation. Not really. We have evidence to suggest that Crouse’s offensive production may have been deflated by some unfavourable variance. We have evidence to suggest that Harkins’ is right where it should have been. Are you willing to share that evidence? CHL-wide shooting percentage and shots data is publicly available on CHLStats.com. We’ve been sharing that resource every chance we get. I’m really leery of the size aspect of these prospects, not because I don’t think a decent power forward is worth taking, but because I think we overvalue what a 6’4″ 18yr old playing against smaller and younger players can do versus what they might look like playing against men five and ten years older. All this being a moose on the walls — forget that. I like the Virtanen pick not because he’s big and strong but because he’s also fast and skilled. Crouse has a good package of skills but his outstanding quality still seems to be size and tenacity. Virtanen has elite level speed and shot though neither the hockey IQ or playmaking skills of a Nylander. Crouse seems to me to be the classic high climber in the draft because of size primarily. I would love to get him in the 20s but even around 15 I think he’s a reach. I would be curious about applying a similar sensitivity analysis for other prospects. Though, I’d assume that would be very time-consuming and most prospects would centre around the mean. This please – at least the top 10? It’d be a fantastic approach to see if some players have ‘inflated’ PCS percentages due to high/low shooting percentages. If Crouse falls all the way to 23, the Canucks would be foolish to pass on him. An interesting point with regards to splitting PPG over half seasons (as with the 0.7->1.1 jump for Crouse) is that this was something that many pointed out with regards to Bo Horvat’s draft season. Bo’s draft season numbers are **remarkably** similar to Crouse’s. Complete with the well below PPG 1st half, and the above PPG 2nd half (although the Knights played more playoff games that year). Even the subjective descriptors are the same (works hard, defensively responsible, used in all situations etc etc). I don’t think Crouse is a top-8 talent on skill in this draft. But anywhere after that you take him and run.